This chocolate sour cream cake is light and airy thanks to the beaten egg whites that are folded into the batter. It's also rich and luscious, from a double dose of dairy—sour cream and butter—and cocoa powder. 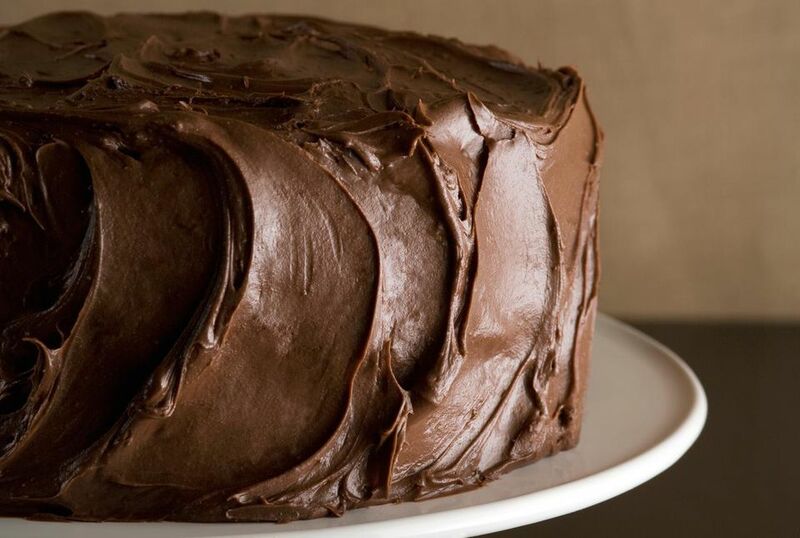 The cake is baked in three layers and is a divine treat when slathered in creamy chocolate butter frosting. Heat the oven to 350 F (180 C/Gas 4). Line three 8-inch layer cake pans with parchment paper or wax paper. Put one yolk in a bowl. Put two of the yolks in a separate bowl with the remaining whole egg. Put the three egg whites in another bowl and set aside. In a saucepan over medium-low heat, whisk the cocoa, 3/4 cup of the granulated sugar, the single egg yolk, and the milk until well blended. Cook until thickened, stirring constantly to prevent sticking. Remove the pan from the heat and let it cool. In the bowl of an electric mixer, cream the softened butter until light and fluffy. Add the remaining 1 cup of granulated sugar, beating until well blended. Add the two remaining egg yolks and the whole egg; mix well. Beat the egg whites until stiff; fold into the cake batter. Divide the batter evenly among the three prepared baking pans. Bake 30 to 35 minutes, or until a toothpick inserted into the center of the cakes comes out clean. Turn out onto racks and peel off the parchment paper. Cool. Fill the layers and frost with chocolate butter frosting or chocolate sour cream frosting. Or use your favorite frosting. In the mixing bowl of an electric mixer, cream the softened butter. Gradually add sifted confectioners' sugar. Add the salt, vanilla extract, melted chocolate, and cream. Beat until smooth and of a spreading consistency, adding more cream if necessary.